Throughout her successful career as soloist, chamber musician, teacher, and concertmaster, Margaret Batjer has established herself as a versatile and respected artist worldwide. 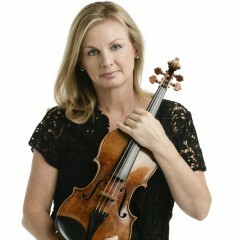 Margaret Batjer has served as concertmaster of the Los Angeles Chamber Orchestra since 1998. Throughout her successful career as soloist, chamber musician, teacher, and concertmaster, she has established herself as a versatile and respected artist worldwide. Batjer made her first solo appearance at the age of 15 with the Chicago Symphony Orchestra. She has since appeared with a succession of leading American orchestras, including the Philadelphia Orchestra, St. Louis Symphony Orchestra, Seattle Symphony Orchestra, Dallas Symphony Orchestra, and the New York String Orchestra, and a re-engagement with the Chicago Symphony Orchestra. Batjer has performed with such European ensembles as the Chamber Orchestra of Europe, the Prague Chamber Orchestra, the RTÉ National Symphony Orchestra (of Ireland), Berlin Symphony Orchestra and the Hallé Orchestra. An esteemed chamber musician, Batjer was a longtime participant at the Marlboro Music Festival, and has often performed on tours with Musicians From Marlboro. Summers have found her performing in the Minnesota Orchestra Summerfest, La Jolla Summerfest, the Sarasota Music Festival, Vancouver Chamber Music Festival, and in the Naples and Cremona festivals in Italy. As a member of the Quartetto Accardo from 1984 to 2000, Batjer performed with Maurizio Pollini at the Salzburg Festival, and at La Scala, Carnegie Hall, and the Queen Elizabeth Hall, London. Drawing upon her affinity for chamber music and curiosity of other artistic disciplines, Batjer developed the Los Angeles Chamber Orchestra’s acclaimed Westside Connections chamber music series in 2012, which brought together music and other artistic disciplines. During the 2017/18 season, Ms. Batjer will launch with the LA Chamber Orchestra a new chamber music series called In Focus and will perform the west coast premiere of a new concerto by Pierre Jalbert with the LA Chamber Orchestra. Among Batjer’s most noteworthy performances have been traversals of the complete Beethoven and Brahms Violin Sonata cycles in partnership with pianist Jeffrey Kahane, at Zipper Hall in Los Angeles. She has also been featured in Beethoven’s Triple Concerto, in partnership with Yo-Yo Ma, Jeffrey Kahane and the Los Angeles Chamber Orchestra. As concertmaster of LACO, Batjer has collaborated with such notables as mandolin virtuoso Chris Thile, pianists Peter Serkin and Wu Han, and cellist David Finckel. Batjer’s most noteworthy recordings are the Bach Concerto for Two Violins with Salvatore Accardo and the Chamber Orchestra of Europe for the Philips label, and a 2003 Deutsche Grammophon recording pairing Batjer and Hilary Hahn as soloists with Jeffrey Kahane conducting the LA Chamber Orchestra. She has also made numerous chamber music recordings on the EMI, Nuova Era and BMG labels. Batjer is a graduate of the Curtis Institute of Music, where she studied with Ivan Galamian and David Cerone. She joined the faculty of the USC Thornton School of Music in 2005 and also serves on the Violin faculty at the Colburn Academy.